Greek filmmaker Yorgos Lanthimos is quickly becoming the master of the subtle, upsetting burn. He first cocked heads with 2009's Dogtooth and brought the same level of weirdness and dry, uncomfortable humor in 2015's The Lobster. 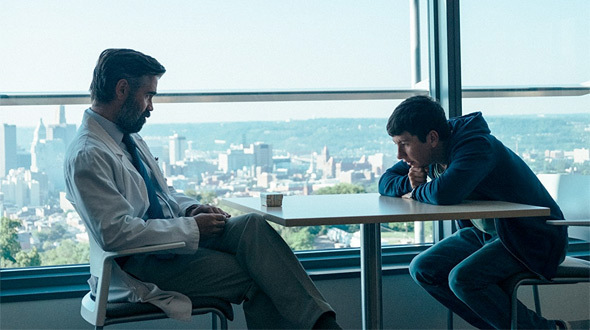 His latest, The Killing of a Sacred Deer, is his most accomplished work to date, a tale of the question of morality in a seemingly peaceful, domestic setting and with a rather large dose of that dry humor he gleefully uses against his own audience. Lanthimos' films don't hand deliver answers, instead forcing the viewer to figure it out along the way all the while asking themselves the very same questions playing out on screen. Sacred Deer is no exception and could go down as the filmmaker's masterpiece. Reteaming with his star of The Lobster, The Killing of a Sacred Deer stars Colin Farrell as Steven, a neurosurgeon and family man who lives a very meticulous life outside of the walls of the operating room where he shines. The interactions with his wife, Anna (Nicole Kidman), and his children, Kim and Bob (Raffey Cassidy and Sunny Suljic, respectively), come off as very regimented, almost cold in nature. At the start of the film, we are also made privy to Steven's relationship with a young man, Martin (Barry Keoghan), who Steven appears to have befriended in some manner. Martin visits Steven's home, has dinner with his family, and strikes up a connection with Kim, the catalyst for the overall relationship made unclear at first. It isn't long before Martin's insistence on staying in Steven's life and even his attempts to connect Steven with his own lonely mother (Alicia Silverstone) grows to discomfort. When Martin notices Steven's attempt at distancing, the young man makes his intentions known, and the task Martin presents to Steven quickly escalates to a psychological tale of horror within the confines of the doctor's home. As with Lanthimos' previous films, the story playing out in The Killing of a Sacred Deer takes its time even if the overall sense of discomfort can be felt from the film's initial opening moments. Even when all is told and everything plays out in organic progression, the viewer is left with more questions than answers, at least question from what is outwardly told. Even still, Lanthimos presents it all with a very clear, dry wit; the screenplay he co-wrote with longtime collaborator Efthymis Filippou is filled with cold, precise dialogue that strikes at the matter but gives no feeling. This is in no way a drawback in the film. Contrarily, Lanthimos and Filippou's cold, hard script is designed to force the viewer into making their own decisions even if those decisions are disturbing to even think about. It's that disturbing nature of the story that also forces the viewer to let out uncontrollable laughs throughout in the face of succumbing to complete anxiety. Lanthimos' camera captures everything with the meticulous precision that is also on display with Steven's scalpel. The scenery rarely rests instead casually moving around the setting to allow the viewer a complete sense of space. This is, perhaps, an attempt to make us aware of the walls closing in around us, but, with this level of artistry on display, it's impossible to care about the transparency of it. Also adding to the discomfort are the calculated performances and frank lines of dialogue being delivered. Being Farrell's second performance under Lanthimos, the skilled actor seems all the more natural with the staccato delivery. The actor knows precisely when to end the delivery, as if there is nothing else that needs to be said on the subject. Kidman, a clear master at her craft, settles into the hardened, emotionless roll with a little more comfort. She doesn't seem as calculating as Farrell, but the combination of the two drives every scene they share with impeccable energy. Cassidy and Suljic give impressive and somewhat tragic performances to their respective character, each delivering a natural build to the tension surrounding Steven's actions and mental state. It's Keoghan in the secondary cast that absolutely shines, though. He effortlessly develops Martin's state as antagonist with every tool he has to offer. His line delivery, eye and body movement, and even moments in which he knows to be quiet and subdued are all strong factors that build Martin into one of the great villains to be seen in a long time. He also has an unmatched gift at laying on the creep factor, all in the name of discomfort. And that, love it or hate it, is where The Killing of a Sacred Deer shines brightest. It's ability to unnerve you while drawing casual laughs out is very nearly unprecedented, Lanthimos' gift as a filmmaker becoming more and more clear with each work. Sacred Deer is the director's best work to date and will definitely be among the best films that 2017 has to offer.